Hekab Be Biblioteca ~ Open Road Community Library: Fundraisers for library raise nearly 3 months of expenses!! Fundraisers for library raise nearly 3 months of expenses!! Amazing Loco Gringos Raise $3000 U.S. for Hekab Be!!!!! Thanks to Loco Gringos Gary Bemis, Debbi Burke, & Nicole Puana who organized and orchestrated a raffle of Gary's artwork, the library can now stay open through the end of the year! We are so amazed at the generosity of all you LGs out there, and touched that so many opened their wallets to give during times of such great economic crisis. If we ever had any doubts (which we didn't), now we know for certain what loyal supporters the library has, and we just can't say thank you enough!! THANK YOU-- MUCHAS GRACIAS-- DIOS BOTIK--MERCI BEACOUP--- AND, SO ON!!!!!!!! 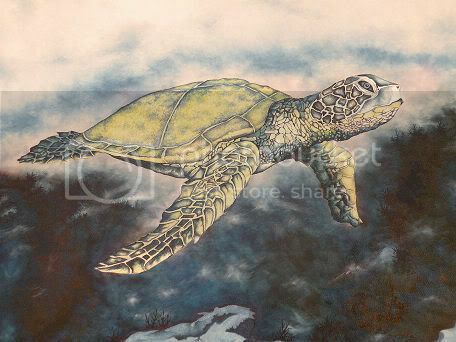 Oil on canvas "Tortuga Rising" went to 1st Place winner Thomas Cochran, aka "Tortuga Tom"
A Print "Tortuga" went to 2nd Place winner Donna Brunton aka "Nipper"
And 3rd Place was a yellow art cooler by Gary and went to Jana Boettger, aka "JDB"
Library Bazaar raises nearly $1000 U.S. thanks to all your donations! This was one of our most successful clothing bazaars ever, and we weren't sure how much locals would be buying since everyone's a little tight on money these days-- just goes to show how much they love the stuff you have all been bringing down to donate. So PLEASE keep it coming! We are especially thankful to Lori Amble, her friends, and the Cougars Community Commitment Organization that her son is part of at their high school in Shawnee, Kansas, all of whom helped collect & bring down 5 suitcases full of donations! See our donor of the month blog for photos of their visit. In the past month, Hekab Be has made substantial donations of school supplies to ALL THE SCHOOLS IN AKUMAL-- this includes: the pre-kindergarten, the Montessori preschool, the kindergarten, the primary school and the secondary school!! That means your donations are going a long way to help all the children and educational institutions of Akumal! And that's not all! Leftover clothing from the bazaar that had not been sold in the last couple bazaars was donated to another school in Playa del Carmen which is holding their own fund-raiser next week. The school is for children who have varying degrees of disabilities, including physical and mental challenges. One child from Akumal attends this school and through his mother we were able to make this clothing donation-- all of the clothes were in great shape, but just a couple sizes too big for our petite-sized locals. We think that in Playa they are more likely to find larger buyers!! As a special treat for the library regulars, Maggie organized a trick or treat event with local businesses who gave out candy to the kids. Here are some photos (click on the photos to see a larger image). Getting goodies from Bart at Turtle Bay Cafe--Yum!